Click on the link below to fill out our application for service after reading the terms and conditions listed below. Please complete the form in full if possible. Cuming County PPD may require a deposit based on your credit rating before your service can be connected. Please call us at 402-372-2463 or 877-572-2463 to discuss your options. Your application will not be processed until the deposit, if necessary, is paid. If you prefer, you can fill out the application for service at our office located at 500 S Main in West Point, Nebraska. Office hours are 7:30 am – 4:00 pm. By submitting this application for service form, you agree to the following terms and conditions. The applicant agrees to pay for electric service delivered in accordance with the terms and conditions set forth in Cuming County Public Power District’s rate schedules, including any applicable fees or interest charges. Copies of the rate schedules can be picked up at the office. Copies of Cuming County PPD policies and procedures are available upon request. A deposit may be required before a service is energized. By providing Cuming County PPD with your phone number(s), you are giving express written consent to call that phone number for Cuming County PPD business. 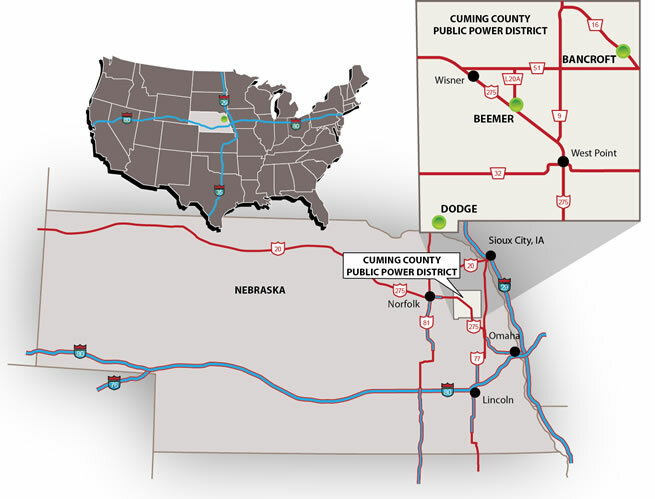 It is the goal of Cuming County PPD to provide reliable energy, however Cuming County PPD is not financially responsible for damage sustained to personal property as a result of power voltage fluctuations or power disruptions. If the applicant is the owner of the property, they acknowledge Cuming County PPD’s right to trim or remove vegetation in the right of way area in order to maintain proper clearance for power lines on the property.